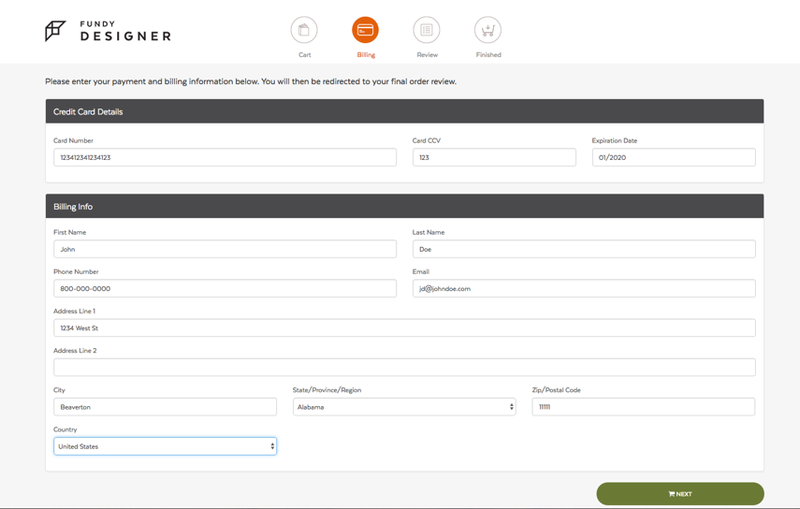 Once your Direct album order has gone through the verification process and been put into queue to be completed, you'll click the "Complete Order" button in the Upload Manager. This will launch your web browser to complete your order and select any album company specific options. This includes cover material options, paper choices, cover embossing, shipping, etc. 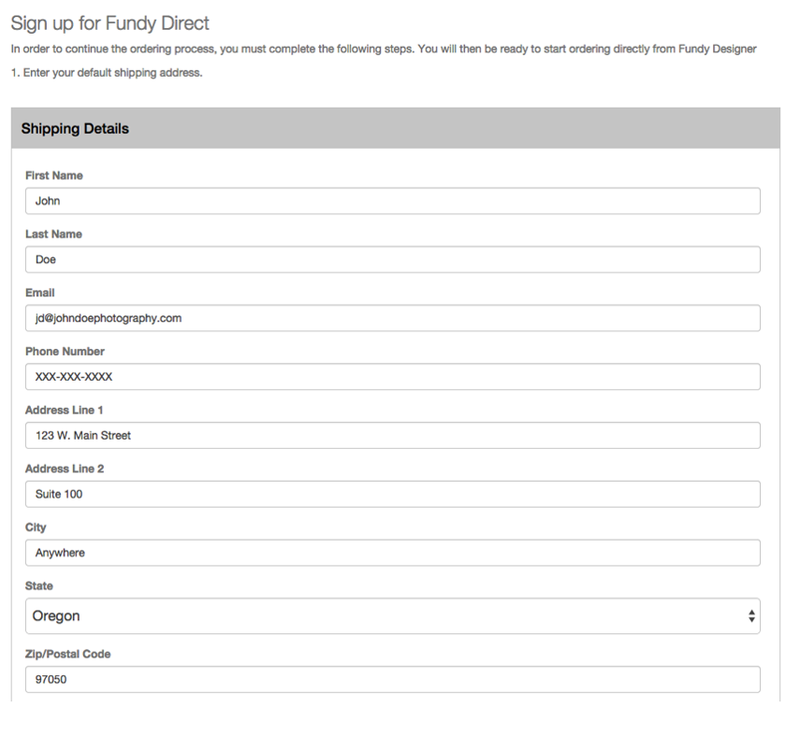 These options will change depending on the album company you are using for your Direct order. The first time you place a Direct order, you'll need to enter your contact and shipping information as well as agree to the Terms of Service in order to proceed with your order. You only need to do this the first time you place a Direct order. The next time you order a Direct album, you'll be taken to the first step of the checkout process. The first option you'll select is the cover material. This will change depending on the album company you are using. Make your selection and then click the green "Update Cart" button to update your shopping cart and continue to the next option. Swatches of the cover material appear in thumbnails to the left of the cover material name. Click on any thumbnail to see a larger swatch of the material. As you go through the options, the shopping cart will be updated and reflect the options you have selected. There is also a button to submit a support ticket. Next, select your paper type options. Click the green "Update Cart" button to continue with checkout. Put in any reference or shipping information during this step. Note: Do NOT put SAMPLE in this field or any other alterations to your order. These notes are not available for the lab to view until the album is completed and ready for shipping. Next, you'll be asked to confirm or update your shipping information. 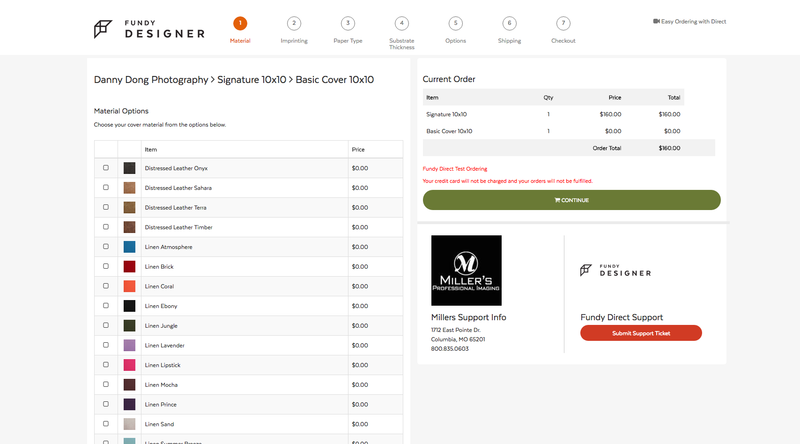 Click the green "Confirm" button to continue with the checkout process. Next are the shipping options. Choose your preferred shipping, then click the green "Continue" button to continue with the checkout process. You're almost finished! Now, you'll be prompted to enter your credit card information for payment, along with your billing details. Please ensure that your billing details match what is on file with your credit card company to avoid any delays. When finished, click the green button "Next" to finish checking out and put your album into production. The final step is to verify your album options, shipping and order details. If you are satisfied that everything is correct, click the green "Submit" button. 1. Coupons are not supported. The price you see in the final review is the price that you will be charged. Once you click Submit, this charge will go onto your card. 2. Some labs offer more options than others, such as album boxes or bags, and imprinting. If you don't see this option available, that doesn't mean the option isn't available at all. It could mean that it isn't available for your selected fabric, etc. 3. When in doubt, contact the lab directly or contact Fundy support.